Benchmarking indicators are used to improve performance within an organization. QUANTOS is experienced in monitoring systems and indicators and can assist in the development of customized benchmarking systems. 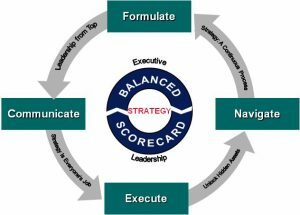 For example, the Balance Scorecard methodology is a well known and worlwide established approach for the integrated measurement of performance in businesses and organisations. The strategic goals are analysed top-down into successive levels, progressively with more and more tactical and operational aspects, until the level of measurable objectives which can have associated target values. Target values can then be set for the upper levels by following a reverse bottom-up approach. In parallel, in this analysis of the strategic goals, each element is assigned to one of suitable “perspectives” (for example financial, customer, internal processes, learning & growth). The end result is a system of key performance indicators which can be used as an integrated monitoring tool.